In a move that could have huge implications for global pork production, a new way to classify and regulate GMOs has been proposed by the Norwegian Biotechnology Advisory Board this week. The board proposed a renewed public debate and dialogue over genetically modified organisms (GMOs) and 17 of the 20 members voted in favour of a new three-tiered classification for genetic engineering. If adopted, this could offer hope that a number of current pig genetics projects – in particular those using gene editing to reduce body fat and increase disease resistance – could gain fairly rapid regulatory approval. The key to the debate is how far and how fast these technologies have developed – factors that make current legislation appear particularly dated. Gene editing can be used to make genetic changes that are equivalent to those that can or do arise naturally, or can be obtained using conventional breeding techniques. Current projects that have gained momentum this year include the Roslin Institute’s work on PRRS-resistant genes, and China’s research on producing healthy pigs with significantly lower body fat. Seventeen members of the board argued that organisms can be divided into different levels, based on the genetic change that has been made, according to general principles. For example, relevant criteria can be whether or not the change is permanent and heritable, whether or not the change can also be made using conventional breeding techniques, and whether or not the change crosses species boundaries. At the lowest level (see diagram below), a notification to the authorities (receipt required before the organism can be released) may be sufficient. 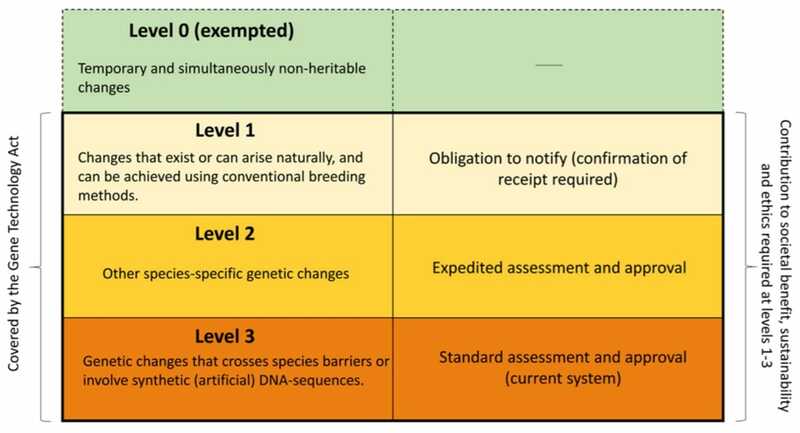 At higher levels, organisms would require approval before release is authorised, but may be subject to different risk assessment and approval requirements. The response has been greeted with enthusiasm by a number of eminent scientists and researchers, particularly those involved in GM-related projects. To facilitate a national debate the board plans to hold open meetings and talks in all of the biggest Norwegian cities over the next months. The deadline for responses to the public consultation is 5 May 2018. More information will follow at www.bioteknologiradet.no/genteknologiloven.